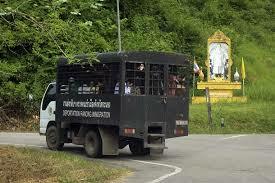 Refugees being transported to a Thai detention center, March 18, 2014. Image used courtesy of VOA News. After more than a year of waiting, almost 300 ethnic Uyghurs are leaving Thailand. On July 1, a group of 173 Uyghur refugees, mostly women and children, left Thailand for Turkey. A week later, another 109 Uyghurs were deported back to their home country of China. The decision on the fate of these refugees, who have remained in Thai custody since their arrests in March 2014, has sparked criticism from human rights groups and protests from the Turkish public. These 282 Uyghurs are part of a group of almost 300 people taken into custody by Thai authorities in March 2014. Many were found in a human trafficking camp in Songkhla province. Since then, they have waited in detention centers in Songkhla, Trat and Rayong while an intense diplomatic battle over their fates raged between the governments of China, Turkey and Thailand. The Uyghurs are a Turkic-speaking, predominantly Muslim people from Xinjiang Uyghur Autonomous Region in China’s northwest. In the last decade, they have left China in increasingly larger numbers, escaping religious persecution and political and economic repression. On July 1, Seyit Tumturk, vice president of the Munich-based World Uyghur Congress (WUC), confirmed through Radio Free Asia‘s Uyghur language service that the first group of 173 Uyghurs were able to “enter into Turkey safely” after arriving in Istanbul. The Uyghur men, however were not given such a chance. On July 8, 109 refugees were forcibly deported to China from Thailand. The group was made up of mostly men, however some women and children were also repatriated. The World Uyghur Congress first reported that 25 men had been shot dead after resisting their deportation in Bangkok. Thai authorities, however, denied the story. Thai government deputy spokesman Weerachon Sukhontapatipak told Radio Free Asia in an interview that “there was no such thing as claimed by WUC.” Another, anonymous source in the Thai government confirmed Weerachon’s statement, saying, “It is not true. There was no killing as claimed by the WUC.” He added that video evidence confirming the refugees’ safety could be provided. In the process of subduing the resisters, 25 men were shot and killed, the WUC originally reported. Hours after its publication, however, the paragraph concerning the killings was removed from the report. Prime Minister Prayuth Chan-ocha, head of Thailand’s military government, seemed unconcerned with issues of international law, claiming that the matter did not concern Thailand. Rights groups worry that the deported Uyghurs will face harsh penalties once on Chinese soil. Uyghurs that have been repatriated from Southeast Asian countries in the past have received long jail sentences and even capital punishment for illegally leaving China. In Beijing, Hua Chunying, spokeswoman for the Ministry of Foreign Affairs confirmed that the Chinese government would pursue legal action against the repatriated Uyghurs. The episode has also led to protests in Turkey, where many see Uyghurs as their Turkic-speaking “cousins”. On Thursday, both the Thai consulate in Istanbul and the Thai embassy in Ankara were attacked during pro-Uyghur demonstrations. Police in Ankara used tear gas there to disperse protesters. Earlier in the week, the Chinese consulate was attacked along with Chinese restaurants in Istanbul. Protesters were angry after reports emerged that local governments in Xinjiang region were prohibiting Uyghur schoolchildren and civil servants from fasting for Ramadan. Similar Ramadan crackdowns have been reported annually for over a decade In response to the protests, the Chinese government issued a travel warning to Turkey for Chinese tourists on July 8. Despite closer ties between Turkey and China in recent years, the issues surrounding the treatment of Uyghurs in Xinjiang and Turkey’s acceptance of Uyghur refugees have prevented the Sino-Turkish relations from moving forward. This week’s protests certainly marks a low point in the relationship and it will be interesting to see how things develop after this latest deportation episode. It is unlikely that China’s crackdowns nor Turkey’s acceptance of Uyghurs will end anytime soon. Despite Thai Prime Minister Prayuth’s claims that Thailand was simply a third party actor, its role in the refugees’ deportation to Turkey and repatriation to China was key. How it navigated this tricky diplomatic issue says much about Thailand’s relations with China. Ties between the Southeast Asian state and China have improved in recent years and increased Chinese investment in Thailand’s infrastructure will only make the two countries closer. Therefore, it was never in doubt that Thailand would acquiesce to the PRC’s request to have the Uyghur migrants returned. However, Thailand, with a proud history of resisting foreign pressures, still wishes to remain independent in the face of a rising China. Its decision to send 173 women and children, likely low-priority targets for China’s internal security forces, to Turkey instead of China is significant. It could be interpreted as a symbol that while China’s clout in the region is growing, it is not yet large enough to wholly influence diplomatic decisions. Future cases of deportation involving Uyghurs in Southeast Asia will act as a barometer of China’s influence on the foreign affairs ministries in Bangkok, Kuala Lumpur and other regional capitals. This episode may have reached its conclusion, but it is unlikely to be the last as long as Uyghurs continue to look for a better life outside China’s borders.